Select your new class and click the Asign Activities button to add activities to the class. You can preview what your students will see in the activity by clicking Preview. Note: You must repeat these steps for each of your classes prior to students logging in. It would be best to have students create accounts and log in to explore the ITSI portal prior to beginning the Watershed curriculum. This activity was modified with permission from the Alice Ferguson Foundation. Students will use a model to create a watershed. By observing how surface water flow is determined by the shape of the land, students will visually and dramatically observe the physical characteristics of a watershed, and investigate the impacts of human land use decisions. Start off by having your students clear off their desks completely as this activity will get them a bit wet. Q. What happens to rainwater after it falls? Where does it go? A. Student answers should include the concept that some rain goes into the ground and some runs downhill. Student Sheets – Crumpled Paper Watershed (in portal or you can print a copy), one sheet of heavy art paper, and markers to each student/group. The activity is designed to be completed in a 15 – 30 minute session. This activity is to be done indoors (on a desk or table) with individual or student pairs. A watershed is all of the land that drains runoff (from precipitation) into a body of water, such as a creek, river, lake, bay or ocean. The boundary of a watershed is the ridgeline of high land surrounding it, like the edge of a bowl. Another term for watershed is "drainage basin." As rainwater and snowmelt run downhill, they carry whatever is on the land, such as oil dripping from cars, trash and debris on streets, or exposed soil from construction or farming to the nearest water body. Figure 1. Watershed adapted with permission from the Alice Ferguson Foundation. Everyone lives, works and plays on land that drains to a body of water, like a creek or river. Our local watershed may lead to a tiny creek, but that eventually drains into a river, bay or ocean. What watershed do you live in? Use app.wikiwatershed.org to find your watershed. Driving Question: What is a watershed? Students will be able to use a model to show an understanding of the term "watershed". Students will be able to identify watershed boundaries on a topographic map. Students will be able to describe how pollution can get into our waterways through runoff. The number of organisms an ecosystem can support depends on the resources available and factors, such as quantity of light and water, range of temperatures, and soil composition. Lack of resources and other factors, such as predation and climate, limit the growth of populations in specific parts in the ecosystem. MS-ESS3-1 Construct a scientific explanation based on evidence for how the uneven distribution of Earth's mineral, energy, and groundwater resources are the result of past and current geoscience processes. Humans depend on Earth's land, ocean, atmosphere, and biosphere for many different resources. Minerals, fresh water, and biosphere resources are limited, and many are not renewable or replaceable over human lifetimes. Theses resources are distributed unevenly around the planet as a result of past geologic processes. Construct a scientific explanation based on valid and reliable evidence obtained from sources (including the student's own experiments) and the assumption that the theories and laws that describe the natural world operate today as they did in the past and will continue to do so in the future. landforms - a physical feature, such as a hill, mountain, valley, plateau, river, lake, etc. Students will enroll in your class using the class word before beginning Part 1. Before beginning Part 1, students should have prior knowledge of the water cycle, including the terms evapotranspiration, runoff, infiltration, precipitation, evaporation, and condensation. Students should also have a background in point source and non-point source pollution. Check with your local Center Directors, EPA, or online websites for additional possible water science resources. For this activity each student will need access to a computer or tablet with Internet access. The activity is designed to be completed in a 45-minute period. This may vary based on the extent of your investigation with the Model My Watershed Site model. According to Dictionary.com, the term watershed was first used between 1795-1805 to describe the divides between stream catchments. A watershed is all of the land where rain drains to a single outlet. Watersheds are nested. Larger watersheds are made up of smaller ones. For example, the Susquehanna River Watershed is made up of the East Branch of the Susquehanna, the Lakawanna River, and the West Branch of the Susquehanna, among others. Figure 1. 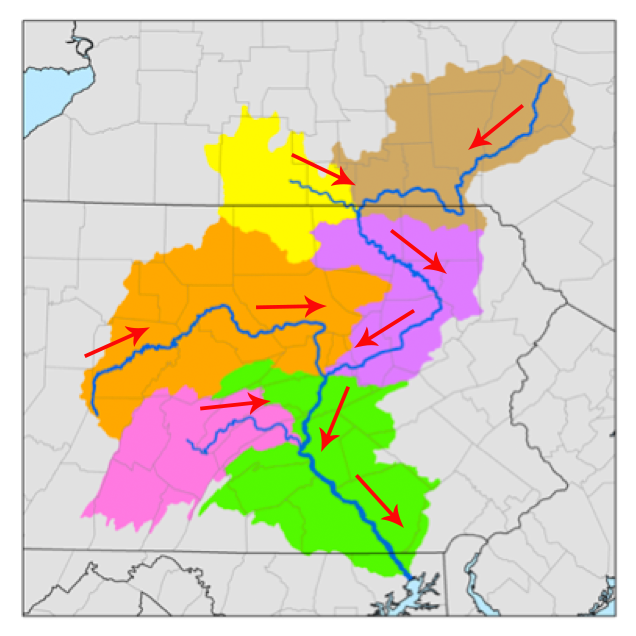 Subwatersheds of the Susquehanna (Wikimedia Commons, Kmusser. Modified by the Concord Consortium: Directional arrows added). Ask students if they live in a watershed. Once they have responded, let them know that everyone who lives on land lives in a watershed. One way to introduce the concept of watershed is to have students stand in a line with their hands over their heads and touch their neighbor's palms. Each one is a watershed since any rain falling between their hands will flow towards their head. Their neighbor is another watershed. Water flows downhill. Whatever washes into the water is carried downstream. You can be affected by what happens upstream and what you do affects those who live downstream. You wouldn't throw trash in your neighbor's yards, so you should not throw pollution into the river that flows past other people's towns or homes. Some students think that water flows south. It does not necessarily flow south, but it always flows downhill! Water will runoff downhill over the surface of the land, soak (infiltrate) into the ground, evaporate into the air, or be taken up by plants and released into the air (transpiration). Evapotranspiration is the combination of evaporation of water off surfaces and transpiration from plants. A transformative concept about watersheds is the River Continuum. Before the River Continuum concept was first developed, people thought that rivers were just like pipes that carried water, but were the same along the entire length. That is not the case. There are specific differences between the headwaters, the middle portions of a river and the lower portions of a river. There are also differences along the banks of a river, in channel shape and size as well as a different assemblage of wildlife in and along the stream/river. The website below provides lots of background information on watersheds. ESSENTIAL QUESTION: How could your actions affect all of your watershed neighbors? Driving Question: What can you do to be good watershed neighbors? Students will explain how the land that makes up a watershed is connected and how the actions of one member of a watershed community can affect all other members of the watershed. The number of organisms an ecosystem can support depends on the resources available and factors, such as quantity of light and water, range of temperatures, and soil composition. Lack of resources and other factors, such as predation and climate, limit the growth of populations in specific niches in the ecosystem. MS-ESS3-1: Construct a scientific explanation based on evidence for how the uneven distribution of Earth's mineral, energy, and groundwater resources are the result of past and current geoscience processes. Use the following questions during the activity with students or the whole class. 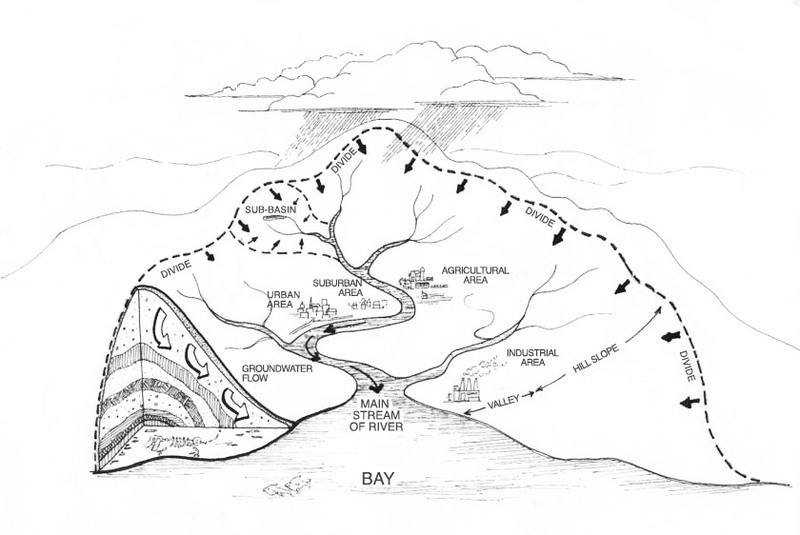 Refer back to the watershed image in the activity. A: Water can runoff over the surface of the land, soak (infiltrate) into the ground, evaporate into the air, or be taken up by plants and released into the air (transpire). Evapotranspiration is the combination of evaporation of water off surfaces and transpiration from plants. Q: What areas in the watershed do you think cause the most runoff? A: Paved surfaces such as parking areas cause runoff of most of the water that falls on them. The remainder evaporates into the atmosphere. However, turf grass can also cause up to 50% of the water that falls on it to runoff. This is because turf grass has dense roots and because mowing compacts the soil, making it more difficult for the water to soak in. How much of your schoolyard is turf grass compared to pavement? If your schoolyard has large grassy areas, it may be causing as much runoff from the grass as from the paved areas. Q: What areas of the watershed do you think cause the least runoff? A: Un-mowed areas can infiltrate more water, as can areas with trees and shrubs. The tree and shrub roots help to provide pore space. Since these areas are not mowed, there is lots of pore space for the water to soak into. This water moves slowly through the soil and enters streams and rivers through the ground. This is why streams still flow even if it has not rained in a while. Q: What is the water table and how does it relate to groundwater? A: The groundwater water table is in contact with the stream and replenishes the flow of the stream when there is no rain. However, confined aquifers are not in contact with the local streams. A layer that does not allow water to move between the confined aquifer and the groundwater separates them. It is called an aquitard. The confined aquifer receives water (recharge) from outside of the watershed and flows through the permeable layer. It can only be accessed by drilling into the aquifer. Q: How does your own property handle rain that falls on it? A: Ask students to describe their property. Is their yard heavily paved? Remind them that the roof of their house also causes runoff. Their lawn also causes runoff (~50% of the rain). Ask them how much roof and driveway they have compared to the lawn area and which (paved or lawn) they think causes the most runoff on their property. You can also ask them if they have areas with trees and shrubs where more infiltration is likely to happen. A: A watershed is the land where all rain that falls on the land flows into the same stream or river. Networks of watersheds are nested with smaller streams flowing into larger ones and those streams flowing into yet larger streams, and those streams flowing into rivers, etc. The largest watershed in the United States is the Mississippi. The water table is the area of saturated soil that is hydrologically connected to the Earth's surface. If there is a drought, it can recharge water into the stream even when there is no rain. Confined aquifers are not in contact with streams, but are confined by impervious layers, usually clay sediments. They have recharge areas (where water gets into the ground) that may be in another watershed. Most well water comes from confined aquifers because as the water moves through the ground, the rocks help to filter out some contaminants. A: Because all of the rain that falls in a watershed drains into the network of streams and ends up at the mouth of the largest stream or river, everything that is on the land can wash into the stream or river. That means that what someone is doing upstream affects people who live downstream. Upstream areas are at a higher elevation in the watershed and drain into smaller areas. Downstream areas are lower in elevation in the watershed and any contaminants that flow down from the headwaters (upstream) can contaminate the water downstream. Q: What activities or land practices are happening upstream in your watershed and why does it matter? A: Ask the class whether there is agriculture upstream. If so, is it made of crops or pastures? Have students describe how this could affect the watershed (sediments, manure, and fertilizer can wash into the streams, adding nutrients that can cause algae blooms and muddy water). If there are areas with housing developments, industrial sites, or other development, ask students how they think this will affect the watershed (increased runoff that can cause flooding and erosion of stream channels). Parking areas can also contribute oil, gasoline, and other substances that come from cars, such as rubber from tires. Q: What are landfills and how do they affect the watershed? A: A landfill is a place to dispose of refuse and other waste material by burying it and covering it over with soil, especially as a method of filling in or extending usable land. A well-constructed landfill should not affect water quality. Landfills are required to be watertight to assure that no pollution can enter the water table and pollute groundwater. Some old landfills may still be in operation, but the EPA is trying to decommission these facilities as quickly as possible. Q: How can nutrients and other substances applied on land (lawns, agricultural fields, and roadways) affect local waterways? A: Nutrients applied on lawns and agricultural fields can wash off into streams and cause what is called eutrophication (nutrient enrichment). This may sound like a good thing, but when there are too many nutrients (nitrogen and phosphorous in particular), it can cause algae to grow at a high rate. Algae blooms cause Biochemical Oxygen Demand (BOD), which depletes the available oxygen for animals living in the water. Even a small excess can cause problems. Nutrients are not necessarily a problem during the day when the sun is shining and the algae are releasing oxygen. However, at night, algae can no longer photosynthesize, so the oxygen level goes down. Also, as algae die, they decompose, using even more oxygen. This can cause oxygen levels to go so low that fish die. In addition, chemicals that are applied to roadways when it snows, such as salt, can wash into streams. Wildlife that lives in freshwater streams cannot tolerate too much salt and will die if the salt level gets too high. What types of land uses are there in your watershed? Make a list. How do you think that these land uses would affect the watershed? Use the list to outline any effects. How is the water table different from the artesian aquifer? Answer: the artesian aquifer is not in contact with the surface because of the impermeable layer. It can receive water from outside of the watershed. This water does not mix with the water table unless the confining layer is breached by drilling a well. Model My Watershed Activity – Once students have completed the Model My Watershed activity, discuss with them what they saw in their schoolyard and how the surrounding area is either the same or different. Q: Besides investigating their schoolyard, what other activities are happening in their watershed? Are there large areas of paved parking, agricultural fields, woods, or other types of land uses? A: Students should identify any large shopping areas or other areas with roofs and parking lots. How do students think they will affect the watershed? Q: How do students think that conditions would be different in the other states (Arizona, Massachusetts, Pennsylvania) and why? A: Using Model My Watershed, students should look for different land cover such as urban, suburban, agriculture, woods, and any other types of land uses. They should identify land cover that does not occur in their location and then the class should discuss how that might compare with their local conditions. They should consider urbanized areas, residential developments, agriculture, wooded areas, etc. and compare them to their local conditions. Building a pond in your schoolyard – see the description in the ITSI portal for building a pond. Before you begin building the pond, check with your building administrator to determine the appropriate place to locate the pond. Once the pond is built, it will require maintenance. In arid areas, the water will need to be replenished periodically. In more humid areas, heavy rainstorms may cause the pond to overflow. Make sure that such an event does not adversely affect any other activity in the schoolyard. If you decide to maintain the pond beyond the unit, you will need to make sure that the pond does not develop an algae bloom (lots of algae that turns the pond green). This happens if there are too many nutrients (primarily phosphorus but also nitrogen, particularly in arid areas). If you add fish to the pond, they can be the source of those nutrients. Their excrement can cause blooms. Algae blooms cause Biochemical Oxygen Demand that can cause the water to become anoxic (no oxygen or not enough oxygen). Installing an aerator will help to ensure that the water does not become anoxic. These are available at pet stores where fish are sold. It will need electricity to run. You will also need to maintain the water level. Once the academic year is over, you will need to make sure that someone will be available to monitor and maintain the pond. Q: What water emergencies might you encounter around your watershed? A: If you have had flooding, chemical spills, drought, or other water-related emergencies, have the students discuss them. Ask them what they believe caused the emergency and how human actions might have either made the situation worse or helped to resolve it. Ask them what they could do to help prevent another emergency. Q: How do you think your yard or the area around where you live positively or negatively affects the watershed? A: Students should describe their neighborhood and decide if it is a good watershed neighbor and why. Do they apply excess nutrients on their lawn? Do they have lots of impervious surface in their yard (roof, walkways, and driveways)? How much mowed lawn do they have? If they live in Arizona, do they practice xeriscaping (plants that do not need lots of water to survive and surfaces that can infiltrate whatever rain falls)? If they live in wetter areas, do they apply lots of fertilizer to their yard that could runoff? What can they do to improve their property? Water Resources Specialists work with communities, businesses, and others to protect local water supplies. It is important for them to be able to work with everyone and try to help different communities agree on what needs to be done. They need to be able to work with many different kinds of people who often disagree. A Water Resources Specialist should have a bachelor's degree in engineering, geology, or hydrology. These disciplines help the Water Resources Specialist understand how water moves in the environment and how to teach citizens how to manage their water to keep it clean. THey will also need to enjoy interacting with the public to help them resolve difficult water problems such as pollution, shortages, and other water emergencies. As stated above, large watersheds are comprised of smaller watersheds. Each of the smaller watersheds is also comprised of smaller ones, until you get down to "first-order" watersheds, where the water drains off of nearby slopes into the stream channel. There are many more miles of first-order watersheds than there are of larger (higher order) watersheds. When two first-order watersheds converge, they become a second-order watershed. No matter how many first-order watersheds flow into that stream, it remains a second-order watershed until it converges with another second-order stream. Higher order streams form in the same way. Two second-order streams that converge become a third-order stream, and so on. The highest order stream in the U.S. is the Mississippi, which is an order 10. Q: How does your state differ from the other states? A: Students should discuss the characteristics of their area as they relate to water resources. They should then make comparisons to the areas in the other two states. What can be learned from the other states? What can your state teach the other states? Each of the states is different and areas within each state are also different. Massachusetts and Pennsylvania are the most similar, so you can begin by emphasizing how they are the same. However, Boston is on the ocean and in the coastal plain. The rivers are subject to tides and some may be brackish (mixture of fresh and salt water). Kennett Square is in the piedmont and has much higher relief than Boston. Their streams are not tidal. Phoenix is much different. It is in the desert and water is in shorter supply than in the two other sites. Their rivers, such as they are, may experience periods when the river channel is dry. Much of the water that moves through the desert goes through man-made canals. Use the Model My Watershed model from the Stroud Water Research Center (SWRC). The website will open in a new tab. Please select Guest for now to use the model. Select the USGS Watershed Unit HUC-10 (Hydrologic Unit Code) boundary in the drop-down menu for boundary type. Click on your school to identify your watershed boundaries. You may need to zoom in/out to view all of the businesses, land cover types (farm, turf grass, forest, etc. ), and local waterways within your watershed boundary. Determine the effects the "neighbors" (businesses, golf courses, farms, houses, etc.) have on the local watershed. Mark any large cities or factories or other features that are upstream from you. What is the name of your local watershed? Can you name any of the tributaries in your watershed? This activity will take place in the classroom and in the field. Students will use the Low Cost Water Monitoring Kit in the field. They will also need a computer or tablet that can access the ITSI portal. Investigating environments requires respect and attention to the existing ecosystem. Be careful not to alter or damage the stream, river, lake, or ocean. Select a site that is easily accessible and safe for inspection. Safety is a primary concern when selecting a site. Stay away from areas with fast moving water, steep banks, or busy roads and bridges. Look for sites with easy access: a park, road crossing with little traffic, etc. If applicable, consider the time it takes to travel to and from a site. Before sampling or crossing private property, obtain written permission from the landowner. If a public place is selected, you may want to alert the local agency responsible for the site. Whatever the location, be prepared for the rain. Wear clothing and closed-toe shoes that can be worn in the rain. Bring rain gear and protective plastic for your mobile devices and equipment. The activity begins with an explanation of what makes a watershed healthy. It describes how the amount of oxygen, phosphate, and the temperature can affect what is able to live in the water. It also discusses how the land in the watershed contributes, either negatively or positively, to the health of the water. Oxygen dissolved in the water is necessary for a healthy waterway and the animals living there. As on land, oxygen can come from photosynthesis by plants. However, it can also come from turbulent water. When water goes through an area with lots of rocks or over a waterfall, it can take up oxygen from the air. Still water or slow-flowing water does not take up much oxygen. However, if the water is flowing from one environment to another, it will carry oxygen with it. Deep pools and lake bottoms can become anoxic, particularly if there is decaying organic matter. Phosphate is a nutrient that supports plants, including algae, living in the water. It is necessary for those plants to grow. However, too much phosphate can cause an algae bloom (lots of algae). When the algae die during the night, their decomposition depletes oxygen as the algae decomposes. This is called biochemical oxygen demand (BOD), and is considered a sign of pollution. Temperature is an important criterion for a healthy waterway. The colder the water, the more oxygen it can dissolve. Thermal pollution from discharge from factories, runoff from paved surfaces, and reduced flow can cause higher temperatures and can negatively affect the ability of the waterway to dissolve oxygen. ESSENTIAL QUESTION – How do we affect water quality in our local waterways? DRIVING QUESTION – What can we do to our schoolyard and on our properties to protect local water resources? Students will identify what substances and conditions positively and negatively affect water quality. Students will identify how human activities can impact water quality. Students will learn how to assess local water quality. MS-ETSI-2 Analyze data from tests to determine similarities and differences among several design solutions to identify the best characteristics of each that can be combined into a new solution to better meet the criteria for success. Although one design may not perform the best across all tests, identifying the characteristics of the design that performed the best in each test can provide useful information for the redesign process–that is, some of the characteristics may be incorporated into the new design. CCSS.MATH.CONTENT.8.F.B.5: Use Functions to Model Relationships Between Quantities. Water washing in from the land can carry fertilizers and nutrients such as nitrogen (N) and phosphorus (P). Just as it makes your grass grow, these nutrients can make algae grow in the water. Unlike land plants, algae have a very short life span. Much of the algae in the water die off each day. At night, algae die off and decay, using up oxygen. Since there is no replenishment of the oxygen during the night, the water can become anoxic. Biochemical Oxygen Demand (BOD) is a often used to measure how anoxic a water source is. High levels of BOD indicate polluted waters and may result in fish and other aquatic animals dying. Students will use the kits provided to measure the chemical properties of the water to determine whether the water is healthy or not. The availability of nutrients is important to gauge. Too little P or N can reduce biological productivity (the number and types of organisms living in the stream). Too much P or N can cause an algae bloom and increase BOD. Turbidity in the water is caused by sediments washed in from the banks and adjacent land. These sediments can carry nutrients with them. If they come off of fertilized lawns or agricultural fields, these nutrients can also cause algae blooms. Clay minerals are very small and, thus, quite mobile. Clay has surface charges that hold nutrients such as phosphate, nitrate, and nitrite. Once in the water, these nutrients can separate from the clay surfaces and cause algae blooms. The clay itself can cause cloudiness. Use the following questions during the activity with individual students, small groups or the whole class. Q: Ask students to describe their local waterways. What do they look like? Do they have trees along the banks or is there agriculture, industry, or homes there? What does the water look like in those areas? What connection do they think there might be between the stream or riverbanks and what the water looks like? A: Gather as many different descriptions of what the banks look like and what the water is like. Are the banks held up by concrete or are the banks wooded, for example? Ask students to connect the local land use to the conditions of the waterway. Concrete banks are not natural and can adversely affect the ecosystem. There are exchanges in nutrients and sediments that are healthy. Too many nutrients and sediments can be a problem. However, low connectivity between the stream or river and the surrounding land is also a problem. The stream and the banks are one ecosystem. See the River Continuum site (science.kqed.org/quest/2014/04/09/navigate-a-watershed) for more information. Q: Have you ever seen a fish kill in a local lake, river, or stream? What do you think caused it? A: Ask the class or a group of students if they have ever seen or heard about a fish kill in a local waterway. Where was it and how extensive was it? What was around the area of the fish kill? Do they think that there was there any connection between what was along the bank and the fish kill, such as industrial buildings, agricultural fields, or paved areas (roads and parking areas)? Fish kills are usually caused by the depletion of oxygen when decomposition of algae and other organic matter uses up available oxygen, creating a condition called anoxia (absence of oxygen). Anoxia is a serious problem in eutrophic (nutrient-rich) streams that receive a lot of nutrient pollution from agriculture or poorly treated waste water. Other causes of fish kills can be the discharge of toxic chemicals from factories (point source pollution), herbicides and pest control chemicals washing off of agricultural fields, or increases in water temperature from thermal pollution (urban runoff or power plant waste water) or lack of shading. Q: Do their families fertilize their lawns? Do they think that this fertilizer gets into any waterways? A: Ask students to describe their neighborhood and its proximity to a water body. Do they think that the fertilizer from lawns, gardens, or farms could reach the waterway? Why or why not? In general, those garden and farm chemicals can reach the streams unless there are vegetated buffers between the yards and field and the streams. Trees are the best buffer and can keep most, if not all, chemicals from reaching the river or stream. However, they need to be wide areas, up to about 100 feet, to be effective. Q: Are there any industries near the waterway? Can students see anything running off of the site that gets into the river, stream, or lake? A: Have students describe any industries and how they may affect the water quality. Did they ever see any evidence that the industry was allowing chemicals or waste to flow into the waterway? Students should be looking for chemical slicks on the surface of the water. They often look like oil and show up as a multi-colored sheen floating on the water. If students see pipes that are discharging liquid into a stream or river, they should ask their parents to report it to local officials. Such discharges are almost always illegal and can be quite harmful to water quality. Q: What other conditions in your area may affect water quality? A: Have students describe any conditions that they think may have an effect on the water quality. Ask them to explain why they think so. As noted above, there are both point source and non-point source pollutants, including chemicals that wash off of farm fields (fertilizer and pesticides), roads (such as salt and other de-icers, oil, and rubber from tires), and lawns (fertilizers and pesticides). Aquatic insects are a measure of the health of a stream. They are also food for fish living in the streams. Pesticides running off of the land can kill those insects' larvae, called macroinvertebrates. Scientists use these insects to determine the water quality of streams and rivers. If students find no or very few macroinvertebrates in the stream, that is a sign the stream is impaired. In the Water SCIENCE program, we will use iSENSE to display a graph when a student enters data using the Innovative Technology in Science I nquiry portal or one of the mobile apps. These data are stored in an iSENSE project so that you can explore the student data from your colleagues' classes in Arizona, Massachusetts, and Pennsylvania. iSENSE is a web system for sharing and visualizing scientific data. It is intended to be a resource for middle school and high school science, math, and engineering instruction. Students can use iSENSE to learn how to explore data to answer questions and to see the value of combining data from multiple people. In this session, you will look at turbidity data that has been collected and shared as part of the "Part IV: Can you filter your water?" activity. In this session, you will explore some professionally collected data from the Charles River in Massachusetts. You can add similar data about a water source near your school if you are interested. After data collection you can show students all of the clustered data points in the iSENSE project. You could also ask students to determine whether the collected data represents a "good" or "excellent" test result, as described in the water monitoring kit (page 32-33). Rank the results of each water quality test on a 1-4 scale. Have students report what they have found. Ask them to assess the water quality in their watershed. Can they explain the conditions? Environmental Scientists study the interactions among biological processes and physical processes in ecosystems. They then take their understanding of those ecosystems and assess how human activity may alter those systems. Environmental Scientists must integrate many biology, chemistry, and ecology topics, along with math, statistics, and computer science. Most environmental scientists have Ph.D.'s. They do their work both in the field and in the lab. Water quality in lakes, streams, and rivers is directly related to the land adjacent to them or upstream. What we do on the land can either improve water quality or degrade it. Most pollutants that affect waterways come from runoff from adjacent lands. The best way to protect waterways is to plant vegetative buffers that can intercept sediment, nutrients, and pollutants. Trees are the best buffer, if the ecosystem can support them. In some arid areas, it is still possible to plant streamside trees since the waterway can provide the necessary water. Q: What is the connection between temperature and dissolved oxygen? A: Colder water can hold more oxygen than warm water. Q: What can be done to decrease temperature? A: Planting streamside trees cools off the stream water by shading it. In large rivers, the trees do not cover and shade the entire river, so they only cool water along the banks, but because large rivers are deeper, the water may still be cool, unless there is thermal pollution (heated water coming from industrial facilities). Q: What is Biochemical Oxygen Demand (BOD) and why should we care? A: BOD is the concentration of oxygen in the water necessary to break down organic material. If there is too much organic material, the decomposition can deplete the dissolved oxygen that is necessary for aquatic animals, which can kill them. Since algae and other aquatic plants can only photosynthesize in daylight, oxygen depletion usually occurs at night. Q: What activities can increase sediment in surface water and what can be done to reduce that? A: Agricultural fields that are plowed in the traditional way (rows of plants with bare soil between the rows) can cause sediment to wash into nearby streams. Also, an area excavated, for example, for construction, can allow sediment to wash into nearby streams. For agricultural fields, no-till agriculture can decrease the amount of sediment since there are other plants between the rows of the primary crop that can hold the sediment with their roots. On construction sites, developers are required to install silt fencing to catch sediment before it leaves the site. These silt fences need to be maintained to work properly. The best way to keep sediment out of streams and rivers is to plant trees (riparian buffers) along the banks. These buffers should be approximately 50-100 feet wide. Dissolved oxygen (DO) is an important characteristic of a healthy water body. If there is no, or low oxygen, very little can survive in the water. Cold water can hold much more oxygen than warmer water. Oxygen in the water can come from photosynthesizing algae or aquatic plants in the water. However, in streams and rivers where there are rapids and fast-flowing water, oxygen can enter the water as a result of that turbulence. Deep pools in streams and rivers can have less dissolved oxygen than the water in riffles, because the deep water may not mix with the current in the stream. Ponds, which do not have running water, tend to have less oxygen and can become anoxic at depth. This activity uses turbidity, pH, phosphate and nitrate readings to determine the murkiness of your watershed. Wear eye protection during experiments. Students should wash their hands after performing experiments. Follow all safety rules and guidelines provided by your school regarding laboratory and outdoor activities. The TesTab reagents used in the Low-Cost Water Monitoring Kit are designed with safety in mind. The single-unit, foil-packaged TesTabs are easy to dispense. Store TesTabs in a cool, dry place and only open the foil when ready to use the tablet. A single tablet, either alone or reacted with a sample, is not a health hazard. However, TesTabs should not be ingested. Often referred to as turbidity, the murkiness or relative clarity of the water is a characteristic that refers to water quality. The more "murky" the water, the more turbid the water is, and potentially the more of a problem it is. Suspended solids, such as clays, have a surface charge that allows them to carry cations (positively charged particles) that can either be nutrients or chemicals. These cations can move on and off the particles and, when in the water column, can cause pollution. Nutrients such as nitrogen and phosphorus cations can cause algae blooms. In most cases, phosphorous is the limiting nutrient in freshwater systems, while nitrogen is the limiting nutrient in marine systems. A limiting nutrient is the one that controls the amount of primary production in the system. The pH of an aquatic system can be altered through acid deposition (acid rain), natural geological weathering processes, and industrial and mining pollution. Most freshwater lakes, streams, and ponds have a natural pH in the range of 6 to 8. If a system becomes too acidic (low pH), toxic aluminum ions can be mobilized from mineral grains in the sediments, fish begin producing too much mucus and suffocate, and chronic exposure leads to reproductive problems in fish. In extreme acidification (below 4.5), little life other than mosses can survive. Likewise, if a system becomes too alkaline (high pH), fish lose their protective slime coats and are subject to skin rashes, eye and gill damage, and greater susceptibility to diseases, and many other types of aquatic life are adversely affected by the increased toxicity associated with an alkaline system. Q: What could be done on your schoolyard to reduce the amount of nutrients that gets into the water? A: Ask students what they think could be done to keep nutrients and sediments out of the water. Could they put in shrubs and trees to buffer a nearby stream? Could they reduce the amount of bare soil that is in the schoolyard? Could they ask groundskeepers to reduce the mowed lawn on the site (not including playing fields)? Could paved areas be reduced to lessen runoff? All of these changes in how the schoolyard is managed could have an impact on nutrients and sediment getting into nearby streams. Q: What could be done in green areas in your neighborhood to reduce the amount of chemicals that could wash into the water? A: Ask students what their neighborhoods are like. Do they believe that green areas in their neighborhood (including yards, parks and wooded areas along the street) are good for the watershed or bad for it? Could they use some of the same measures that they discussed for their own yards or to be good watershed neighborhoods? ESSENTIAL QUESTION: What human activities contribute to water pollution? Driving Question: What can we do on land to reduce the amount of sediment and chemical pollution in our streams? Students will learn what causes turbidity. Students will learn how turbidity can affect water quality. Students will learn about ways to reduce turbidity. MS-ETSI-2: Analyze data from tests to determine similarities and differences among several design solutions to identify the best characteristics of each that can be combined into a new solution to better meet the criteria for success. Q: How does your schoolyard contribute to sediments flowing into nearby streams? A: Ask students to identify areas that they think could be contributing sediments to local waterways. Is there bare soil in the schoolyard? Have they seen muddy water running off of the schoolyard during rain events? Have students ask groundskeepers if they use fertilizers? Do they think that the fertilizers are running off with the sediments? Q: Which of your local streams look murky? A: Have students identify streams or rivers that they would call murky. What color is the water (green or brown)? Have them discuss where those streams are and what areas they drain (industrial, agricultural, residential, or a combination). Streams that are murky tend to be receiving runoff from developed areas, such as cities and industrial sites. They can also be receiving sediment from agricultural fields. This sediment can be carrying nutrients that can also cause algae blooms. Forest buffers along stream banks can reduce or eliminate sediments and nutrients from reaching the stream. Q: What is the difference between green and brown water? A: Green water reflects a growth of algae. Algae, as students learned before, can cause reduced oxygen. Whether there is algae or not is determined by the presence of nutrients in the water. If the stream is green, where do students think the nutrients are coming from? If the water is brown, it is sediment. Sediment can come from agricultural fields that have bare ground between the rows. That sediment likely also carries fertilizer that can enrich nutrients in the stream and cause algae blooms. Phosphorous and nitrogen are the primary problems. Another source of sediments is construction sites where excavation is happening. Contractors are required to put up sediment fences. However, they are not always maintained and can become ineffective, thus sending sediment into nearby streams. Ask students where they think sediments and/or nutrients are coming from. Of course, both could affect the water. What do they think could be done to change this? Discuss trees as buffers that can help protect waterways. These buffers need to be at least 50 - 100 feet wide, but wider is better. Q: Have students heard of any incidents of pollution in any waterways? A: Have students search for news clippings and talk with parents to identify any pollution incidents. Can students find the cause of the incident? What, if any, damage resulted from the incident? Q: What industries are located along local waterways? What substances do they use that might cause pollution? A: Construction sites can cause turbidity. Pollution can also be caused by industrial spill. Students can do web searches of news stories or ask parents, grandparents, and other friends and neighbors if they recall any chemical spills. In Pennsylvania and Massachusetts, turbidity can come from construction sites. In Arizona, this may be less prevalent since there is less precipitation. However, when it does rain in Arizona, it can cause flash flooding and sediment entering waterways. Q: What agricultural land is in their watershed? What is being grown on those fields? A: Ask students if there is agriculture in their watershed. If so, ask what is being grown and whether the fields are near a stream or river. Are there buffers between the fields and the stream/river bank? Are they tree buffers or grass buffers (trees are better because they slow the water and soak up nutrients)? Buffers are more prevalent in Pennsylvania and Massachusetts. Arizona is unlikely to have them, since the area is so arid. However, there is agriculture there and when heavy rains do occur, they can cause flash flooding and the movement of sediment. Q: Are there industrial or commercial sites near the streams or rivers? What impact could that have on the streams? What could be done to reduce the impact? A: Ask students what they think could reduce the impact on nearby streams or rivers. Could they plant buffers along the stream? Could there be ways that the chemicals could be kept on the offending property? Could runoff be diverted into an infiltration basin or rain garden? Soil is able to neutralize and sequester chemicals that waterways cannot. The following EPA website has an excellent PDF on managing stormwater to reduce pollution. It includes conservation practices that reduce runoff. Q: Have students share their results on the murkiness of their samples. A: Have each student or group of students discuss what they found. Were there differences? If so, why do they think that happened? Q: Do they think that the murkiness comes from algae, from sediments, or a combination? A: Have them justify their answer. Was the color more green or brown? Was it possible to determine what was causing the murkiness? Remind students that streams and rivers can have both algae and sediment. In fact, the sediment can carry nutrients adsorbed to clay particles. However, the color of the water can suggest whether both are entering the stream or whether one is more prevalent than the other. Ask students if they can identify the source of the pollutants. Using an aerial photograph can help identify potential sources, either agricultural or industrial. Q: What would they recommend to reduce the murkiness in the water? A: Have a discussion with the entire class on how to address the murkiness. Were the problems nutrients in the water that caused growth of algae, runoff of sediments from construction sites or parking areas, or a combination? Again, students may want to look at aerial photographs of the areas near where they collected their samples to see if there was any construction there, if there was a wastewater treatment plant putting nutrient-rich effluent into the waterway, or agriculture fields that were contributing sediment and fertilizers into the waterway. In the Water SCIENCE program, we will use iSENSE to display a graph when a student enters data using the Innovative Technology in Science Inquiry portal or one of the mobile apps. These data are stored in an iSENSE project so that you can explore the student data from your colleagues' classes in Arizona, Massachusetts, and Pennsylvania. Environmental Restorative Planners work with communities and landowners to remediate damage that has occurred on the land from development, bad farming practices, or pollution spills. They must first investigate the history of the property and identify the cause of the damage. Once they have done that, they must then determine what action will decrease or remove the pollution. In some cases, there are natural remedies, such as planting trees along the stream banks or keeping livestock out of the stream. In other cases, however, the contamination can be from toxic chemicals or heavy metals. In those cases, they can either remove the soil and place it in a lined landfill or use phytoremediation (plants that can take up toxic substances) to remove the pollution. Once the plants have incorporated the offending chemical, the plants need to be removed, including the roots, and treated in a facility dedicated to sequestering the dangerous substances. Toxic chemicals, radioactive materials, and heavy metals need to be treated carefully by trained professionals in places where the pollutant will not move back into the environment. They are often placed in landfills that are lined with clay so that the substances cannot be washed into groundwater. Q: Are there areas in your neighborhood, city, or state that are contaminated with toxic substances that have gotten into local streams or rivers? A: Have students ask parents, grandparents, and neighbors if they are aware of any streams or rivers that are or were contaminated with toxic substances. What was done to remove the toxic material? How is the water quality in those waterways now? What do the students think could be done to ensure that waterways are not contaminated in the future? Once the activity is completed, discuss what can affect the pH of water coming off of the land. One of the most important things that contributes to the pH of surface water is the soil in the area. Soil with high nutrient levels can buffer pH. Soils that have low nutrient levels tend to be more acidic. Acidic soils form on granitic rock. Students may be too young to remember the issue of acid rain. It caused streams in some places to become very acidic, which killed fish. These soils formed on granite, which has a low buffering capacity. Where soils are more basic, water that runs through them to streams has a higher pH from the buffering capacity of the soil. In this activity students use Earth materials to filter water. Eye goggles and disposable gloves are recommended. Students should be told to not drink their filtered water since not all toxic substances may be filtered out with their design. As we learned when we first saw the Earth from space, our planet is a water planet. But most of the water on Earth (96%) is in the oceans, so we cannot drink it. Lots of the rest is in polar ice caps. Only about 1% is available for us to use for growing crops, drinking, bathing, and other uses. The Earth has many ways to naturally filter water. When water percolates through rocks and soil, it picks up ions from them. These ions can affect the pH of the water. It can also remove some substances that are in the water. Clay particles have what are called exchange sites that are negatively charged. Clay particles can hold positively charged particles (cations). These particles move on and off the charged clay particles. Most of the cations that adsorb to the clay are nutrients. However, clay and other Earth materials can also filter substances. In this activity, students will decrease the turbidity of dirty water by using a filtration device they build. Your first task as an engineer will be to understand the problem. This includes understanding what the constraints are when it comes to solving the problem. What materials and resources will you have available to solve the problem? How much time do you have to figure out a solution? How many people are on your team who can work together to solve the problem? What will each person on the team do? What knowledge resources (e.g., science textbooks, or water filtration/treatment guides, experts) do you have access to? How will you know that you have solved the problem? Identify criteria that you will use to show that you have effectively solved the problem (e.g., is the water clear? are there no particulates floating in the water? is the water colorless as seen by the naked eye? is the water odorless?) Now that you have understood the problem, you have to figure out how will achieve the solution. Gather as much information about the problem as you can from the available resources. Resources include reviewing background knowledge on how water utilities treat drinking water, what materials are used, how the materials work to clean water, and so on. Make sure to make notes on what you learn and how you will use that information as you design your solution. Write down as many ideas as you can think of on how you will use the provided materials and the information you have gathered to solve the problem. All ideas should be listened to and thought through. In the end, select one idea that your team agrees upon to test out by planning it carefully, building the solution, and carefully studying how well it works. Take your agreed upon idea and plan it out in great detail. As you plan, make sure you consider the materials you have available to create your solution. Initially, make rough sketches. Develop a final clean drawing where you neatly label parts and materials. Write accompanying descriptions. In the descriptions write how you believe these will work. Note why you selected the materials. Plans should be developed in specific detail, so someone else can follow them. Now that you have your plan, build it! Follow the plan carefully. Test the plan, noting how it worked. You have to determine the procedures you will use to test the filtration device. For instance, you can note down the amount of water you poured into a filtration chamber. Then measure and note down the amount of water that came out of the filtration chamber after a specific amount of time. You have to determine the procedures you will use to test the filtration device. You can also take pictures of the water sample before filtration and after filtration and use them to document your solution. Engineers often go through an iterative process of repeating necessary phases in the design process until they are satisfied with the solution. Based on the amount of time and materials you have, go through the design process as needed. Make notes on what you would do differently in the next iteration (next repetition of the design process), why, and what results you expect. Your city or municipal water treatment utility usually performs two types of water treatment: treatment of water before it is used for drinking and other purposes, and treatment of wastewater such as sewage so it is safe to enter the environment. Treatment plants for drinking water and for wastewater have equipment and processes to remove or destroy harmful materials and organisms. A treatment plant uses tanks and mechanical parts such as valves and pumps to move the water through the different processes. These processes are designed and managed by water engineers. Other engineering specialties, including mechanical, chemical, materials science, and construction engineering, play a role in the construction, design, and maintenance of water treatment plants. Drinking water treatment performed by your water utility usually involves these sequential phases. Coagulation: Dirt and other floating particles that cause turbidity are removed from the water using chemicals. Flocculants are chemicals such as alum (aluminum potassium sulfate) that cause the dirt and other particles to stick together; flocculants are added to the water, which creates larger particles called floc. Sedimentation: The floc particles are allowed to settle to the bottom of the sedimentation chamber through which the water moves. Often, the water is agitated (stirred) using forces (such as gravity, centrifugal acceleration) to allow for the motion of the floc particles through the water. The floc or sediment is allowed to settle to the bottom of the sedimentation chamber and water is then moved to the next phase, which is filtration. Filtration: The water is typically slowly passed through layers of activated carbon, sand, and gravel. In fact—similar to the water cycle itself, which is a slow process and an example of how water is naturally filtered through the Earth's layers. As water moves through the Earth's layers, solids are trapped; disease-causing microorganisms, such as bacteria, are also trapped, and either die naturally or become food for microorganisms that live in the soil. Activated carbon is used for its adsorption property. That is, it allows specific types of particles to adhere to it. The typical surface area for activated carbon is very large, approximately 1,000 square meters per gram, which is one of the reasons why activated carbon is used in water filtration. Disinfection: Before water is stored and distributed for drinking use after filtration, water is typically disinfected using chemicals. This is done very carefully to ensure that the chemicals used do not cause harm to humans. Water is typically disinfected with chlorine or other chemicals, called disinfectants, to kill any bacteria and other harmful organisms. In some cases, water is also disinfected before the sedimentation process begins as well. * See Chapter 3: Engineering & Society in Baker, D., Ganesh, A., Ganesh,T. G., Krause, S., Morrell, D., Roberts, C., White-Taylor, J. (2009). Engineering: An Introduction for High School. (213 pages). San Francisco, CA: www.ck12.org. Watch these videos for further information about the role of alum in the filtration process. You will need to collect Earth materials, such as sand, gravel, carbon, and alum. You will also need dirty water. Take care that the materials used to pollute the water for your filtration experiment are safe when used with students. If you take water from a local water body, make sure it does not have any toxic or harmful chemicals in it. If you need to "make" dirty water, you can add potting soil, clay (water based), oil, and vinegar. Add garlic powder for odor. Do not put too much into each sample as it may be too difficult for the students to remove. 2-3 sheets of torn toilet paper so they are visible when added to the water. Q: What do you think you would find in water you would get from a nearby stream? Would it be clean enough to drink? A: Ask students to look at the land around the local stream using your map. What land uses are there? What could the land put into the water? What natural "resources" are there nearby that could filter this water to make it cleaner? Remind students that some substances, primarily nutrients, can be taken up by plant roots. Soil can also filter some substances because of the characteristics of clay and organic matter, which can hold on to some substances, like leaves and debris. If there are industrial areas or large paved areas, there may be chemicals that are not easy to remove. Q: How do you think that the Earth filters water? A: The most effective way that the Earth cleans water is to evaporate it. When it condenses and falls as rain or snow, it is cleaner. Evaporation is an important part of the water cycle. However, evaporating the condensing water is not a great way to get clean water. It is very expensive. For one thing it takes energy, which is very expensive. By evaporating water, you also lose the nutrients that are in natural water. So, filtering water the way the Earth does is a better and lower energy way of getting clean water. Earth can filter water because Earth materials include charged particles, such as clays and organic material. These particles can hold onto constituents in the water that are oppositely charged. Earth materials can also physically remove sediments that cannot flow through the pore spaces. Most soil also contains microorganisms that can interact with substances in the water. These interactions can break down chemicals or kill pathogens. ESSENTIAL QUESTION: How does the Earth filter water so that it is clean? Driving Question: How can we use Earth materials to clean dirty water so that it is safe to drink? Students will hypothesize how each material interacts with given contaminants (for example, are they adsorbed on sediment, are they broken down by microbes, or oxidized by aeration?). Students will test their prediction by testing how Earth materials remove water contaminants. Students will evaluate their results to conclude how effective Earth materials are as filters. The uses of technologies and limitations on their use are driven by individual or societal needs, desires, and values; by the findings of scientific research; and by the differences in such factors as climate, natural resources, and economic conditions. An option for the design of a water filtration system. Q: What is clean water? A: Distilled water is pure water (H2O). However, it is not safe to drink on a regular basis. Natural water that comes from the Earth has minerals in it that we need. If we only drank distilled water, we could experience mineral loss (Ca, Mg, etc.) that could lead to health problems such as osteoporosis, diabetes, and heart disease. Q: Does this mean that we can drink directly from streams and rivers? A: No! That is not safe unless you have had the water tested to ensure that there are no harmful chemicals or pathogens in the water. Unless you have tested water quality, it is never advisable to drink from a stream, pond, or river. There are kits that can be used to kill germs. However, it is difficult to remove toxic chemicals without specialized equipment. For all practical purposes, nobody should drink untreated surface water if they can avoid it. Q: So, how do we get clean water? A: If you live in an area where your water comes to you through a pipe, your municipality treats it to assure that it is clean. The Environmental Protection Agency (EPA) monitors public water supplies. If you get your water from a well, it is important to have it tested frequently. If you are drinking from a well, it is also important that the well be deep to avoid the potential for contamination from the surface. If well water is found to be clean, the Earth is doing its job and the water is safe to drink. In general, municipal water is safer because it is regularly tested. However, there are many rural areas where municipal water is not available. In those areas, well water is usually the only alternative. Q: What Earth materials do you think could filter harmful things out of the water? A: Think about how the Earth naturally filters water. What does the water go through? Soil has lots of things in it that could filter the water. Soil composition differs depending on where the soil comes from. Clay, sand, silt, clay, microbes, and more are found in soil. What does each do to filter the water? Sand removes the large particles; silt removes finer particles. Clay particles are flat and it is hard for water to drain through. However, they also have the ability to hold onto charged particles. Cations are positively charged particles that may be nutrients or other chemicals. Clays have negatively charged areas that can adsorb these particles. If you use clay, it may be necessary to mix some silt or even sand in with the clay to make sure that the water can flow through. Remember, clay is used to line landfills to keep toxic chemicals from getting into groundwater. Clay liners do not easily pass water through, fortunately. Potassium alum, also known as potash, has been used for centuries to purify water. It is naturally present in sulfate minerals and was derived from the weathering and oxidation of those minerals. Charcoal also occurs naturally when organic material is burned and buried. Although layers of charcoal are not common, coal layers are and have many of the properties of charcoal. Both substances can be found in specific geologic formations and have been used for centuries to purify water. Q: What problems do you anticipate when you filter water? A: Let students provide their concerns about what could happen. Help them, as a group, to work through a few scenarios that could cause problems. Q: How did your filter apparatus work for you? What problems did you have? How much water came through? How long did it take? A: Let each student or group report how their apparatus worked, or didn't work. Let them share their experiences so that they can, collectively, try to design the best possible filter. If there is time, build that filter (if no individual or group already did that). Demonstrate it so that others can see how it works. One possible problem is that some substances might clog the filter. If this happens, have the students mix some sand in with the substance to make sure that there are pore spaces where the water can filter through. If the charcoal causes the water to darken, suggest that students rinse the charcoal to remove the coloring before putting it into the filter. This may be necessary for other materials, as well. Once the students have completed their first test at filtering the water, have them share any problems that they had so that they can learn from what others have tried. Environmental Engineers must be interdisciplinary experts. They need to be able not only to understand engineering principles, but also biological, chemical, and physical principles that affect the environment. They also need to be able to find solutions to environmental problems, for example, keeping water clean by building better wastewater treatment facilities, cleaning up chemical spills using phytoremediation (plants that take up toxic chemicals), or building facilities that do not harm the environment. Environmental Engineers need to study math and physics as well as biology and chemistry in order to solve difficult environmental problems or help developers to plan and build more environmentally friendly buildings. They need to have a bachelor's degree at a minimum. Q: Once you filtered your water, do you think it is clean enough to drink? Why or why not? A: Discuss various types of substances that the filtering exercise could not remove. Viruses can be quite dangerous and are very small. They are also everywhere. Not all viruses are pathogens, but you don't want to find out whether they are by getting sick. There are also chemicals that cannot be removed simply by filtering. Discuss what those might be. Harmful things that dissolve in water could go through the filter. For example, prescription drugs are chemicals that are not usually removed by sewage treatment plants. When the Stroud Water Research Center did a seven-year study of the New York City water supply, they found that there were many prescription drugs, such as antibiotics and birth control, as well as caffeine and pain relief drugs in the water supply that were not removed by sewage treatment. In this activity, students use their microscopes to investigate pond water, and photograph what they see. Once they have looked at the water and taken their pictures, ask them to describe and share what they found. Were there plant cells, algae, mud, small organisms, etc.? If they could not photograph them, have them draw what they saw and also describe them in words. Do they think that there might have been things in the water that they could not see? What could those things be? Could there be germs? Could drinking this water cause them to be sick? Have a discussion of why pond water is not safe to drink. In general, it is not safe for students to drink this water, so make sure that students do not do so. Laura is a microbial molecular molecular and fish ecologist. Aquifer - a unit of rock or an unconsolidated deposit is called an aquifer when it can yield a usable quantity of water. Groundwater - the water present beneath Earth's surface in soil pore spaces and in the fractures of rock formations. Ridgeline - a long area from which the surface drops away steeply on one or two sides, such as a bluff or precipice. Transpiration – the process that plants use when they take up water to support photosynthesis, then release water back into the atmosphere through evaporation.